Easton was designed as such that a stretch of Bismarck Avenue terminates directly in front of the Grand Easton Terminal, at the intersection with Hermatite Street. The massive structure in the background is the GetaLife Building, also within Easton. Easton is a neighborhood in central Algonquin, Liberty City. It is bordered to the north by Jade Street (Lancet), to the west by Columbus Avenue (Star Junction and The Triangle), to the south by Garnet Street (Lower Easton), and to the east by Albany Avenue (Presidents City). Easton is a primarily commercial area. The neighborhood is dominated by the massive Grand Easton Terminal adjoining the GetaLife Building, which spans from Columbus Avenue to Albany Avenue between Jade and Hematite Streets. The terminal, while not accessible by the player, serves as the major commuter hub of Liberty City, shuttling in businessmen and workers from the surrounding suburbs and locations all the way to the Midwest. Many outlets and stores can be found around the perimeter of the terminal, also making it a popular destination for local residents and shoppers. The residential sector of the neighborhood is located along its southern face, featuring many hotels for visiting tourists and a few moderately-tall tenements. The aforementioned Grand Easton Terminal is located in and named for the neighborhood, with entrances at Hermatite Street, Albany Avenue and Columbus Avenue, and the GetaLife Building directed connected to the northern end of the terminal. Also, a hospital can be found at the intersection of Jade Street and Albany Avenue, at the border with Lancet. In The Ballad of Gay Tony, the Leopolds department store, which is non-interactive in GTA IV, is designated as a bar which players can bring their friends to during outings. The Liberty City Subway system serves the neighborhood. The eponymous station is located on Columbus Avenue between Iron and Hematite Streets, along the neighborhood's border with The Triangle. The station is served by both the Algonquin Outer Line and K/C Algonquin Inner Line; it's an important stop on both routes as it is the only transfer point in the entire subway. Easton is also an access point for maintenance workers into a stretch of subway line between Easton station and Emerald station. Its maintenance access point, located off Bismark Avenue, is used during "Three Leaf Clover" as an improvised escape route from Emerald station via the connected railway tunnel. New York City's Grand Central Terminal and MetLife Building are obviously represented by Grand Easton Terminal and the GetaLife Building, while the residential areas of the neighborhood are most closely modeled after East Village, Manhattan. Other landmarks replicated include Helmsley Building, whose duplicate is situated behind and dwarfed by the GetaLife Building, and the DeVinne Press Building and Colonnade Row (at Bismark Avenue and Hematite Street, neighboring Grand Easton Terminal, and Columbus Avenue and Hematite Street, respectively). Grand Easton Terminal in GTA IV. 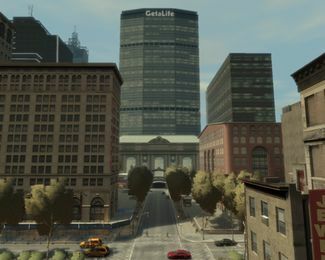 The GetaLife Building in GTA IV. The dwarfed Grand Easton Terminal is visible in front of the building. Leopolds in GTA IV. The store is a drinking venue for outings in The Ballad of Gay Tony. Replica of the Devinne Press Building in GTA IV. Replica of Colonnade Row in GTA IV. A Fanny Crabs outlet is based here. Service entrance into the Easton-Emerald section of the Liberty City subway, GTA VI. This page was last modified on 19 November 2012, at 00:42.